Golden Eagles forward Jamil Wilson is averaging 11.7 points and 4.6 rebounds in 24.7 minutes per game this season. 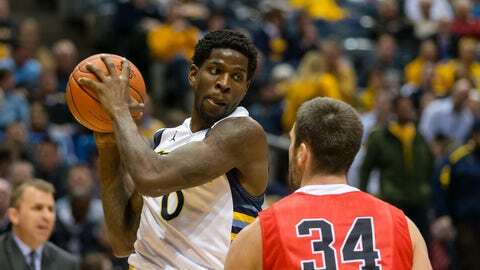 Marquette senior forward Jamil Wilson has practiced the past two days and is expected to play in the team’s Big East opener against Creighton on Tuesday night. Wilson suffered a left knee injury after being fouled on a dunk just five minutes into Marquette’s 71-48 victory over Samford on Saturday and did not return to the game. Marquette coach Buzz Williams said Wilson wanted to come back into the game, but he decided not to risk further injury with conference play right around the corner. He underwent an MRI on Saturday but a serious injury wasn’t found. That’s good news for the Golden Eagles not only in the long term, but also for Tuesday’s matchup with the Bluejays. Wilson will more than likely match up with Creighton All-American forward Doug McDermott. Wilson is averaging 11.7 points and 4.6 rebounds in 24.7 minutes per game this season. The 6-foot-7 native of Racine, Wis., was named to the preseason All-Big East second team.